Whether you are looking for increased productivity and fuel efficiency or superior comfort and visibility, the CASE 885B motor grader provides the strength and durability you can count on. 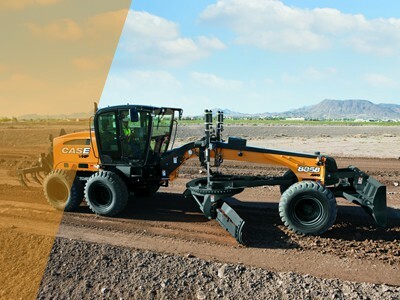 With all daily maintenance checks located at ground level, the 800 series motor graders help save time and money. Front articulation allows for a tight turning radius while the A-frame drawbar provides outstanding stability; allowing you to increase efficiency on jobs of every size. Get the flexibility of both manual and automatic shifting to match the job conditions at hand with our powershift direct-drive transmission. Increased power, stability and turning performance to the moldboard are delivered through the A-frame and high-strength circle. For unmatched ground-breaking power, our rear-ripper accommodates up to five teeth and front scarifier accommodates 11 teeth. Move even more dirt with less horsepower and better fuel economy through a multi-radius involuted moldboard design. Superior all-around visibility and a clear view of the moldboard are achieved with floor-to-ceiling cab glass. Operator comfort is provided by ergonomic, low-effort control levers positioned within easy reach. Get easy access to the engine and perform daily maintenance checkpoints with the friendly flip-up hood. Reaching the fill port or grease points is simple with ground-level access including our exclusive fuel fill with lockable cap.